I am wondering how the mainstream media has become enamored with a Tea party candidate's dabbling in witchcraft - repeating the story over and over. But when our President had numerous Marxist connections and still does, non of it got reported. This country used to look at Marxists as enemies - when did the concept go beyond mainstream to something that is so taken for granted that no one questions it? We spent billions of dollars to fight communism over the years sacrificed American lives and considered the spread of communism such a threat we almost went to nuclear war with Russia. Yet a few decades later we seem to have forgotten what the country fought for all these years. We forget the eastern European immigrants who fled communism and the killings and oppression that went with it. I still hear stories of the food lines you had to wait in while in Russia and Poland and they horrify me. And yet the media ignored the issue of Marxist ties to the White House through the whole election cycle and even today. As the first week of the fall begins, there is a wealth of news to share such as China getting the iPad, Facebook status updates leading to burglaries, another high- level departure at Nokia and GoDaddy.com looking to sell itself for a billion dollars. The pace of acquisitions hasn't slowed as of late - HP just announced it will acquire ArcSight to bolster its security offering and PAETEC will pick up Cavalier Telephone. Perhaps the biggest news of all is Wal-Mart's entry into the MVNO space - they will be reselling T-Mobile's service. If there is a common theme here - it's that technology continues to be full of opportunity as it becomes more common. I have said before that the Obama administration has been the most anti-business of any administration I have ever seen. There is hostility towards success achieved through legal business means and demonization of virtually every profession (except ironically lawyers, professors and community organizers). Doctors have been accused or removing tonsils and amputating without reason. Bankers are irresponsible and fat cats. Oil industry execs - well you know. Hedge funds - are bad people for fighting the White House during the whole autogate controversy of last year where GM and Chrysler were bailed out. One has to imagine these comments are made to somehow help the US population but it is statements like these that are in-part responsible for keeping companies from hiring and well-off consumers from spending. I can't imagine this is what our President intended to happen but the rhetoric hasn't ceased and neither have the job losses. While I come into work every single day and promise myself I won't write about politics it is apparent that politics has become a greater factor in business than one's ideas and potential. In other words if the government continues changing the pieces around, businesses will continue to hold off on spending and so will consumers. It has been an extremely exciting week again for tech news and moreover for me personally as I got a chance to open up my Sony Dash and it is a very cool addition to my desktop as it allows me to view my photos and take advantage of widgets of all kinds which among other thinks allow me to see the pandas at the San Diego Zoo. 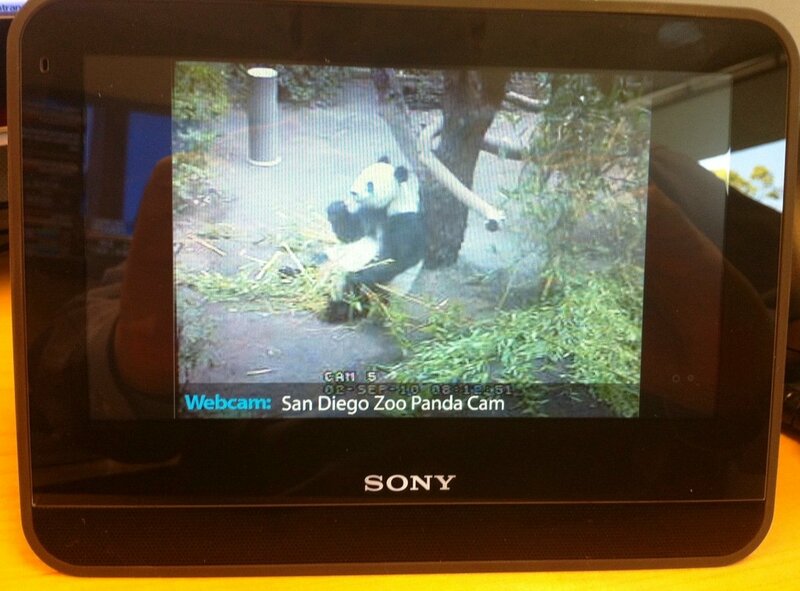 This handy gadget has a slew of communications, social networking and calendar features as well but for now, I just want to see the pandas. The big news from yesterday of course was Steve Jobs onstage pushing a slew of new iPods and a rental-only model for Apple TV and a social network integrated into iTunes. I read with tremendous interest about Goldman Sachs and their unusual interest in PetroAlgae, a company in the renewable energy field which is not only small but losing money. Generally a company like Goldman would laugh at such a small IPO. Courtney Comstock of Clusterstock details the pros and cons of the deal and refers to a Reuters article written by Steve Eder. One pro is the idea that Goldman positions itself nicely in the alternative energy field with this deal but one wonders if Goldman really needs this positioning as even with all their recent PR problems they are seen as the best and brightest on Wall Street and most every firm would die to work with them.